The USI provides flexible and reliable non-contacting ultrasonic level and volume measurement and control in a wide range of applications. The USI advanced level controller can be used in pump control applications, with 6 relays as standard. Accurate and reliable monitoring and control is achieved by utilising the USI’s powerful processors and 7 inch high resolution touch screen. Providing the user with unrivalled accessibility and clarity of information, with the tanks fill status and all process variables instantly visible to the user. The USI uses a 7” TFT full colour 840×480 display to give sharp images and clear programming screens. In level applications tank shapes are selected from a pictorial map which does away with complicated programme selection as used by other manufacturers. Relays can be chosen from drop down menus and a graphical simulator is available to enable the user to simulate filling and emptying a tank in order to check his process control choice. The user even has the option to change background, text and shape colours to compensate for different ambient light conditions. The USI display screen can be viewed on a remote computer or through a GPRS modem. So at all times you can view the status of the USI without having to leave the office. MPAC Ltd. Also can configure and install this product for you if necessary. 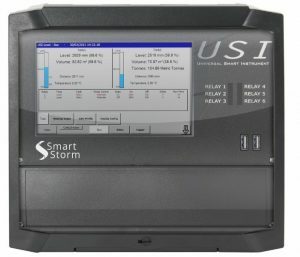 The USI is unique in that the user can display data reports and time elapsed graphs of all measured data directly on its own graphics display without the need to download to a PC or laptop. No other instrument offers this versatility and by simply inserting the date fields required, data is instantly displayed and can be analysed in situ without the need to reload back at the office. Of course if the user wishes the data can be downloaded onto a USB stick in seconds and reloaded onto a separate PC with data displayed through our freely available Windows package “Inquisitor”. The USI has up to 20 years of storage capacity for environmental measurement data. 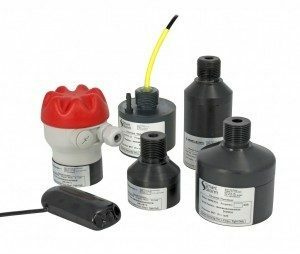 Smart Storm ultrasonic sensors are known for their reliability and highly accurate measurement, please see the ultrasonic sensors page to find out more and see full specifications.